Breakfast. The better angels of our nature tell us it is "the most important meal of the day," and some recent consumer attitude studies have shown that people listen to their better angels at least some of the time. Food manufacturers know for certain that consumers have some very specific demands when it comes to breakfast food, and these demands often involve a different kind of breakfast than what was popular just a couple decades ago. "Consumers consider breakfast to be the most important meal of the day, even more than lunch or dinner," states a recent study from Mintel Group, Chicago. "Specifically, a 2009 International Food Information Council Foundation's Food and Health Survey found that 93 percent of Americans consider breakfast to be the most important meal, as part of an overall healthful diet." By comparison, just 87 percent feel this way about dinner and 81 percent say the same about lunch. And yet, consumers often skip breakfast. "The breakfast industry may need to more effectively communicate the benefits of breakfast, as 56 percent of the survey respondents indicated they did not eat breakfast every day," the Mintel report (Breakfast Foods US Sept. 2012) continues. Protein, fruit, sugar and caffeine are still a big part of what consumers want for that first meal of the day. While great taste is just as important as ever, there is a growing expectation that tastiness should come with at least a side of whole grains -- and hold the trans fats, sodium, added sugars and other nutritional demons, please. For folks with cholesterol issues and other specific health and dietary concerns, dairy and eggs are given careful consideration, too. Mintel says the breakfast category is shaped mainly "by the performance of the two main segments: breakfast meats and sweet breakfast breads and pastries." Both of those are doing well because processors "focus on developing products relevant for consumers striving to live a healthful lifestyle, without compromising on indulgence and taste." Convenience also ranks high in the morning, maybe even more so than at other times of the day. 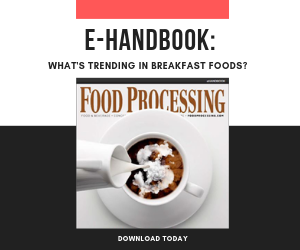 Hand-held breakfast foods are the fastest-growing part of the frozen food segment. Once a novelty, the breakfast burrito has become a staple, and if it can go from frozen to piping hot via a 2-minute trip to the microwave, it is even more likely to find favor with early birds. So what is a food processor to do? Well, there are new ingredients available (and more in the pipeline) that are doing more to help breakfast foods satisfy appetites while appeasing better angels. "When looking for ingredient solutions, makers of breakfast foods are most concerned with making their product more appealing to their consumers," says Patrick O'Brien, marketing manager-bakery for Ingredion Inc., Westchester, Ill. "Increasing the appeal can come by way of enhancing the nutritional value, such as adding a fiber or whole grains, or reducing the sugar or fat content. Other ways to increase the consumer appeal can be through texture or flavor enhancement, as well making products more convenient for the consumer." Oatmeal has been considered a healthful breakfast food since before the development of the modern supermarket and multi-media campaigns and, in 2013, it still sports a healthy halo. Oats in various forms can be used in a variety of breakfast food formulas. Today's consumer may have a better understanding of why oats are good for them, and they have more opportunities to invite them over for breakfast. Sometimes that takes shape as a familiar breakfast product revamped to include more healthful grains. As an example, in January, Kellogg Co., Battle Creek, Mich., introduced a Pop Tart brand extension made with oat flour and fruit. Oatmeal Delights Pop Tarts are made with toasted cinnamon oat crumbles on a baked oat flour crust, and Kellogg has started with two flavors: Strawberry and Maple Brown Sugar. While the nutritional panel on Oatmeal Delights is an improvement over classic Pop Tarts (one pastry offers 3g of fiber) the ingredient deck includes more than 35 items including fruits, vitamins, starches, sugars, artificial flavors and two certified colors. Oats are at the forefront of the ingredient portfolio at Grain Millers, Eugene, Ore. The company offers oats in flake, bran, flour, groats and fiber forms. But the company supplies more than oats. FiberMaxx is a relatively new line of functional fibers suitable for fortifying a number of foods, including cereals. A blend of soluble and insoluble fibers, they provide the benefits of each group. And the three stock versions of FiberMaxx - custom variations can be made -- are good economic substitutes for processors working to maximize total dietary fiber in a product. Don't forget the ancient grains, which have found modern popularity in breakfast foods. Rajen Mehta, senior director of specialty ingredients at Grain Millers, reminds that the company sources amaranth, buckwheat, chia, einkorn, emmer, kamut, millet, quinoa, sorghum, spelt and teff. There are two stock blends of ancient grains - AG51 formulated for taste and AG52 optimized for nutrition - as well as custom formulations. Beyond oats at Kellogg, the company also extended the Frosted Mini Wheats line this year to include Mini Wheats Crunch. This is the first non-shredded wheat version of the popular brand, but it offers the same 6g of fiber per serving as Original Bite Size Frosted Mini Wheats. As the market leader in convenient breakfast foods, Kellogg has gone this route before with products such as co-branded Eggo/Nutri-Grain Whole Wheat Waffles, which bring 3g of fiber per serving to a familiar, convenient comfort food. As Mintel notes, getting grains and fruits into breakfast foods can make the difference between a successful launch and a near-miss. Using oils and fats with a better profile can also affect the outcome. "Shortenings are no longer selected only based upon performance and price," says John Jansen, senior vice president of regulatory, quality and innovation with Bunge North America (www.bunge.com), St. Louis. "They are now often selected to meet specific nutritional targets, including trans fatty acid-free, lower saturates or specific levels of specific unsaturated fatty acids." Baked goods make up a large share of the foods consumed at breakfast, and consumers are less likely to take a pass on those offerings when marketers can show that they are made with better oils. "Historically, shortening and oil products for baking were made from partially hydrogenated soybean oil, which contained some levels of trans fatty acids," Jansen says. "In many cases those products are now made from palm-derived ingredients with higher levels of saturated fats, but no trans." Mintel's report on breakfast cereal points out a predicament faced by Kellogg and other cereal makers. While food processors may feel obliged and/or pressured to develop foods that place a high emphasis on nutrition, consumers are often driven by flavor expectations. When it comes to breakfast cereals, the youngest consumers are most interested in highly sweetened cereals, but those products where the sugar level has been dialed back just a bit are also performing well. Within the cold cereal segment, Mintel further divides it by four sugar-based subsegments. The "cold cereal/high sugar subsegment," in Mintel terminology, is the biggest, accounting for 41 percent of all cold cereal in estimated 2011 food, drug and mass merchandise sales. Its share has grown by 1 percentage point despite sales dropping 0.7 percent. The cold cereal/high sugar and cold cereal/medium-high sugar subsegments both declined during 2009-11, but did so at a slower pace than the two lower-sugar subsegments. The correlation between higher sugar content and superior sales performance with the cold cereal sector is evident going back further than 2009 as well, clearly indicating that although some consumers have professed an interest in eating better, in some cases they are clearly opting for sugary cereals. Between 2006 and 2011, cold cereal/low sugar had the biggest decline of any subsegment (-9.5 percent). By comparison, cold cereal/medium-high sugar grew 23.9 percent, far more than any other segment. It is possible that the cold cereal/medium sugar subsegment, which currently represents roughly 10 percent of the cold cereal market, is perceived as an acceptable compromise between children's interest in sweet cereals and parents' desire to encourage better eating habits. Ingredion's O'Brien says today's ingredient suppliers offer sweeteners, flours, starches and grains that make it easier for food makers to find the sweet spot somewhere between catering to cravings and providing a bland product that is focused solely on nutrition. "One example of this could be the demand for gluten-free cereals," O'Brien says. "Specialty starch and specialty flour solutions, in combination with other ingredients, can help create high quality, gluten-free breakfast foods that are indistinguishable from wheat-containing alternatives." The hot cereal segment posted estimated total U.S. 2011 sales of $1.2 billion with slight growth of 2.1 percent. Some of this growth is a result of Americans looking to eat better, and hot cereal, particularly oatmeal, has benefited from its healthful positioning. Mintel forecasts that hot cereal will experience faster growth than cold cereal and will reach $1.4 billion in sales by 2016. Grains like oats, barley and quinoa will make up the foundation of these kinds of products, and milling companies are offering new types of grains and new versions with improved functional characteristics. Starches, flavors sweeteners and natural colors will also come into play, as food processors develop hot cereals that appeal to consumer desire for hot cereals that taste good and are good for them. Protein is also an important component of breakfast foods, and among the standard breakfast protein foods are eggs and breakfast meats. Greek-style yogurt has also become well-known as an excellent source of protein. In the U.S., the vast majority of the yogurt is flavored and sweetened, and while traditional Greek yogurt is served plain or with simple fruits and sweeteners, Greek-style yogurt, which now accounts for nearly half of U.S. yogurt sales, is becoming Americanized. General Mills recently introduced a new line of blended Greek-style yogurt in its Yoplait portfolio in six different flavors. Starbucks in July announced it will start selling its own brand of yogurt in its stores by 2014, with a goal to take the product to major grocery stores by 2015. "Evolution Fresh, inspired by Dannon," implies who's actually manufacturing the product. The first half of the name comes from Starbucks' late-2011 acquisition of a juice company Evolution Fresh. The first product in Starbucks stores will be a Greek yogurt parfait. While eggs continue to appear in the center of the breakfast plate, they also have a traditional role as an ingredient in other breakfast foods. New research touted by the American Egg Board at last month's IFT Food Expo illustrates how the growing interest in gluten-free foods could pave the way for eggs to be further utilized in the baking segment. A team of Kansas State University scientists led by Fadi Aramouni found eggs made a noticeable positive impact on gluten-free bread roll quality, increasing volume and cell elongation. "Before beginning our research three years ago, we found, despite the rapidly expanding retail market for gluten-free products, many of the gluten-free offerings were of mediocre quality," Aramouni stated in a release. "As a result we wanted to see if we could improve gluten-free bread quality to help celiac sufferers and those who choose to eat gluten-free." Taste, volume, color, moisture and other characteristics are often lacking in gluten-free bread products when compared to their wheat-based counterparts. The team knew if they could positively impact these characteristics, they would improve gluten-free bread quality. Gluten forms a protein matrix that gives bread volume and texture, so the idea was to replace the gluten with an ingredient that could provide structure to the bread. "Eggs -- also a protein source -- are known for their foaming ability," said Aramouni. "Using eggs as part of a gluten-free bread roll formulation, we were able to increase volume, and improve color and texture." The addition of eggs made the texture softer and helped maintain moisture and retard staling. Food manufacturers will continue to look for innovative solutions when developing new products for any meal or snack occasion, as consumers keep expecting more from their foods. The future looks bright for breakfast foods and those food formulators who are focused on that first meal of the day.